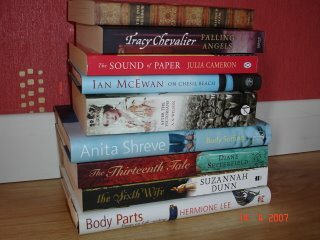 What to read next? 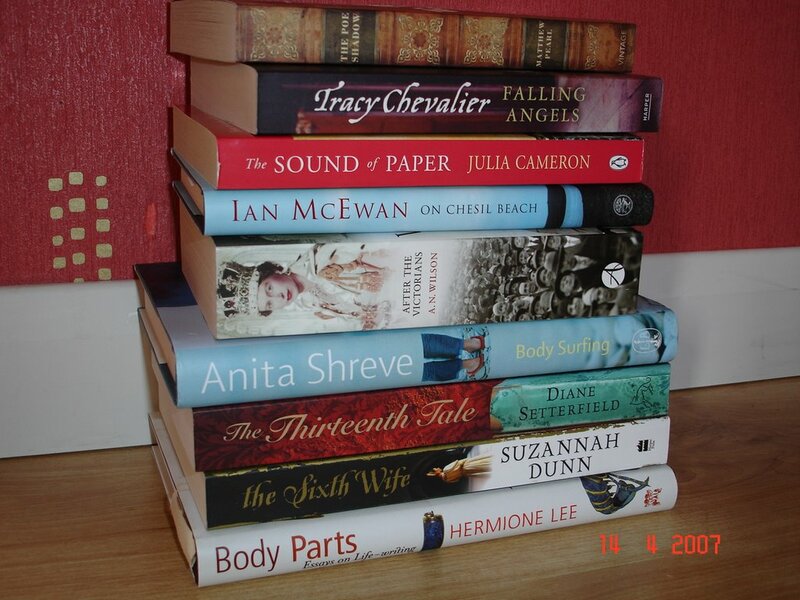 Three new books arrived this morning from Amazon – Body Surfing and On Chesil Beach to add to this pile of some of the books waiting to be read. Other books waiting to be read include numerous library books, which I have to keep renewing and may have to return unread. The third book is Rick Stein’s Guide to the food heroes of Britain, which I ordered thinking it was his Food Heroes recipes. Anyway it’s interesting, having info on local suppliers that were unknown to me. I started Body Parts a while back and stopped when other books demanded to be read. The jacket blurb says it’s about exploring writers’ lives in connection with their works and includes essays on Virginia Woolf, Jane Austen, Elizabeth Bowen and one entitled “Reading in Bed, which I’m known to do. Shall I pick this up again, or read The Thirteenth Tale? I’ve read both good and bad reviews of this and resisted buying it for some while now, but when I saw it in the local coffee shop as a BookCrossing book I just had to take it home to see what all the fuss was about. Shall I opt for The Poe Shadow, seeking to solve the mystery of Poe’s death. A while ago I read The American Boy by Andrew Taylor, which was about Poe as a boy at school in England and The Poe Shadow could be a good follow up and then of course I could continue by reading Poe’s own Tales of Mystery and Imagination? Or maybe I’ll go for some non-fiction with A N Wilson’s After the Victorians: the world our parents knew, another tempting read – the blurb on the back says it “is utterly compelling – erudite, intelligent and wise. Essential reading.” It certainly won’t be a quick read with over 500 pages, plus notes and a massive bibliography. Or it could be the new Anita Shreve, or Ian McEwan – both favourite authors of mine, or Tracy Chevalier or Sarah Dunn – both unknown to me.